Post Tagged with: "isp liability"
KEI this morning released the May 2015 draft of the copyright provisions in the Trans Pacific Partnership (copyright, ISP annex, enforcement). The leak appears to be the same version that was covered by the EFF and other media outlets earlier this summer. As such, the concerns remain the same: anti-circumvention rules that extend beyond the WIPO Internet treaties, additional criminal rules, the extension of copyright term, increased border measures, mandatory statutory damages, and expanding ISP liability rules, including the prospect of website blocking for Canada. Beyond the substantive concerns highlighted below, there are two key takeaways. First, the amount of disagreement within the chapter is striking. As of just a few months ago, there were still many critical unresolved issues with widespread opposition to (predominantly) U.S. proposals. Government ministers may continue to claim that the TPP is nearly done, but the parties still have not resolved longstanding copyright issues. Second, from a Canadian perspective, the TPP could require a significant overhaul of current Canadian law. If Canada caves on copyright, changes would include extending the term of copyright, implementing new criminal provisions, creating new restrictions on Internet retransmission, and adding the prospect of website blocking for Internet providers. There is also the possibility of further border measures requirements just months after Bill C-8 (the anti-counterfeiting bill) received royal assent. 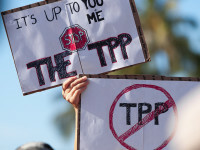 The leak of the Trans Pacific Partnership intellectual property chapter generated global coverage as full access to the proposed text provided a wake-up call on U.S. demands and the clear opposition from many TPP countries. My first post highlighted Canada’s opposition to many U.S. proposals, but nowhere is that more evident than in the section on Internet service provider liability. In fact, ISP liability in the TPP is shaping up to be a battle between Canada and the U.S., with countries lining up either in favour of a general notification obligation (Canada) or a notice-and-takedown system with the prospect of terminating subscriber Internet access and content blocking (U.S.). With the House of Commons back in session this week, there has been growing speculation that Bill C-32, the copyright reform bill, will emerge as a government priority. Given the rhetoric we’ve seen over the past three months, it seems likely that proponents of the digital lock approach will seek to paint critics as anti-copyright, pirates, and radical extremists. While the rhetoric may seek to delegitimize consumers and many Canadians vocal on the copyright issue, the reality is that many consumer and education groups have been far more supportive of the bill than proponents such as the music industry.